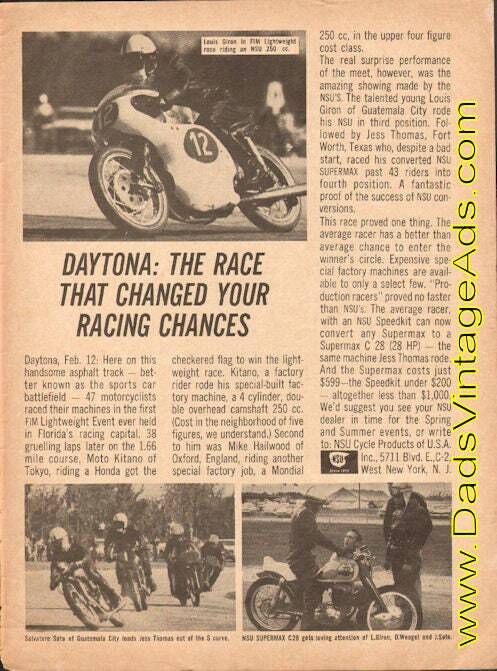 Daytona: The Race that changed your racing chances...Here on this handsome asphalt track better known as the sports car battlefield - 47 motorcyclists raced their machines in the first FIM Lightweight Event ever held in Florida's racing capital. 38 gruelling laps later on the 1.66 mile course, Moto Kitano of Tokyo, riding a Honda got the checkered flag to win the lightweight race. Kitano, a factory rider rode his special-built factory machine, a 4 cylinder, double overhead camshaft 250 cc (cost in the neighborhood of five figures, we understand). Second to him was Mike Hailwood of Oxford, England, riding another special factory job, a Mondial 250cc in the uppoer four figure cost class. The real surprise performance of the meet, however, was the amazing showing made by the NSU's. The talented young Louis Giron of Guatemala City rode his NSU in third position. Followed by Jess Thomas, Fort Worth, Texas who, despite a bad start, raced his converted NSU Superman past 43 riders into fourth position. A fantastic proof of the success of NSU conversions. This race proved one thing. The average racer has a better than average chance to enter the winner's circle. Expensive special factory machines are available to only a select few. "Production racers" proved no faster than NSU's. The average racer, with an NSU Speedkit can now convert any Supermax to a Supermax C-28 (28 HP) - the same machine Jess Thomas rode. And the Supermax costs just $599 - the Speedkit under $200 - altogether less than $1000. We'd suggest you see your NSU dealer in time for the Spring and Summer events or write to NSU Cycle Products of U.S.A.